A favorite NSC ritual of so many of our alumni is recounting the off-season's "Small World Stories" at the first campfire. But why wait! North Star alumnus Robby Rutkoff (1996-2007) lives in New York City where he is currently teaching second grade. Robby is looking to pursue a career in education administration, and is looking to take the next step toward that goal. Through a connection made by his mom, Robby set up a meeting with a prominent education reformer on the East Coast. One of the questions that Robby was asked was, "If education all of a sudden closed its doors and you had to choose a new career, what field would you choose?" Robby at the Council Ring in 2005. Robby responded, "Well, I spent 12 summers at camp and thought for a while that camping would be my career, so I'd probably go back into camping and try to open my own summer camp." The education reformer then asked what camp he went to, and when Robby told him it was North Star, he was caught by surprise. The education reformer was Norman Atkins, a North Star Camper in the 1970s. He grew up in Evanston, IL, and remembers Leb's days as a counselor. In his career, Norman has opened several successful, high-performing charter schools in New Jersey and New York. The kicker - Norman named his first school North Star Academy! - David Felsenthal stopped by Uncle Dan's to say hi. He is working as a consultant in Chicago and got married about a year and a half ago to his wife Nooshin, who is from St. Louis. Coincidentally, one of Nooshin's friends from high school is now married to NSC alum Jason Olt, who happened to be one of David's closest friends at camp. Congratulations to both couples, and to the Olt's who recently had their first child! - Keith Kretchmer came in to visit at Uncle Dan's in Evanston with his daughter Anna. Anna and her husband were visiting for the first time with their new baby boy from Birmingham, England, where they live and work. In addition to to the ongoing celebration of Keith and Valerie becoming grandparents, they were also celebrating Anna's birthday! Congratulations to all of the Kretchmers! - Brian Harris stopped in to say hi as well. He is working as an IT consultant and currently doing work in Dallas for Lockheed Martin. Brian was married last year and he and his wife live in Chicago. Things are going so well for Brian that he was able to brush off the fact that his cameo from the old North Star video has become outdated. This is our second year doing such an event and our goal is to help each of our first-time campers to feel comfortable and get even more excited for camp. It is our hope that this allows each of our first-time campers to meet some staff and other first-time campers so that they can see some familiar faces when they arrive at the bus. Please RSVP to Andy@NorthStarCamp.com or at 847-943-9559, and feel free to contact me if you have any other questions as well. We hope you'll stop in and have some pizza! While April 22nd marks the official Earth Day, all summer long we have the opportunity to realize the importance and beauty of the place that we live. I thought about writing a blog entry in honor of Earth Day that discussed the values of environmental conservation that are reflected at North Star and the efforts that we put forth at camp to make the planet a better place. Instead I wanted post this slide show of the amazing place where we spend our summer. Those of us who have had the opportunity to spend at least one summer in the Northwoods of Wisconsin have been had the honor to spend time in a truly amazing environment. North Star and Uncle Dan's have teamed up to offer 10% off of on all your camp needs. Stop by and jump start your camp shopping with this great discount, and use it on all of your outdoor needs. Check out the Packing List to see what you need for camp or just come by to catch up with North Star. Andy and Dan will be in the stores to help you with your camp shopping and to get excited for the summer! We will be passing out information about North Star and for our Rookie Weekends as well. Anybody interested in North Star for this summer or down the road should stop by and take advantage of this great discount! This discount is available any time in the stores for you, your friends and family, as well as on the website. Just bring in the This Coupon, or use the promo code "NORTHSTAR" at www.udans.com. 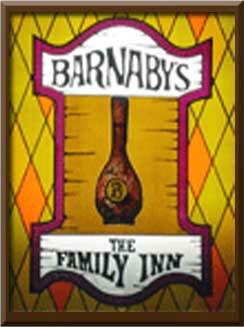 We look forward to seeing you at Uncle Dan's! The Investigative Journalists of Leb's Ramblings have been hard at work over the past week to bring you the story of PsychoZ50, this year's NSC March Madness Champion. After going undercover in Nashville, Tennessee, we have discovered that a boy of not yet 10 years old came out of nowhere to upset nearly 150 North Star campers, staff and alumni. And the tale of how he did it **when largely embellished** is even more remarkable than the accomplishment itself. J-1 camper Zach G. had this planned all along. Last summer was his first at North Star, and on the first night's candlelight ceremony he announced his goals. "I want to learn to waterski," Zach said. "And I want to have a lot of fun. But most importantly, I intend to win NSC March Madness!" While everyone was wondering about a different madness, Zach was hard at work. He had prearranged to have the world's tallest counselor as his own, hoping that he had a penchant for basketball predictions. The only problem was that he was from Australia. "Sure I like basketball," said counselor Richard Roberts. "I'm 7'6" how could I not? But when Zach tried to contract me out as his basketball Nostradamus, I knew I was in trouble." What Richard lacked in basketball knowledge, he made up for in intelligence. Richard, who presently works for Boeing, set out to develop an algorithm that could predict the NCAA tournament champion. Richard counseled Zach to enroll in the basketball program, where he could covertly attempt to steal all of the knowledge of basketball from John Sheehan. After learning of such metrics as True Shooting Percentage, PER, and assist-to-turnover ratios, Zach realized he was on to something. "After reading Richard's books on aerospace engineering and plugging in some of the basketball statistics, I knew I was on to something," Zach said. "Sure most campers don't want to spend their summers reading The Physics of Flight, but my eyes were on the prize." As he started filling out his bracket, he realized there was a problem. His secret formula required that he would have to pick his beloved UNC to lose. Though he was heartbroken when they lost, he knew he must push forward. The most important factor in his calculations surprisingly had nothing to do with basketball, but the state that the team came from. "I knew the championship game was going to be a team from Connecticut against a team from Indiana, but who in the world thought it could be Butler!" Even with his errant forecast of Purdue playing in the Championship, Zach finished in the 99.8% percentile of all of the brackets completed on ESPN.com. He finished in first place 30 points ahead of 1st runner up Lisa Lissner and 50 points ahead of 2011 CIT Max E.
"We're going to have our eyes on this kid for years to come," Max said. "Unless he leaves early for the pros, Zach G may win this thing every year." Congratulations Zach - the 2011 NSC March Madness Champion! As you may know, we've spent some time redesigning our logo apparel and we're happy to announce that Cloz, our apparel outfitter has (more or less) finished their update of the store. There are a few items that will be added, but if you are interested in checking our our new logo gear, you can head over to the online store at http://www.cloz.com/northstarcamp and check out our new stuff. We have a larger selection of logo items, multiple logo options as well more color options. We don't have a mandatory uniform and we do not require that you purchase any of the logo gear... though we certainly think that our new designs and items are worth while. If you do decide to make buy some items, we recommend that you do so sooner rather than later. Cloz does have a longer turnaround time, so production and shipment can take a few weeks. If you're in the Chicagoland area, you can also go to the Cloz Store in Buffalo Grove, where you'll be able to check out sizes and order items in person. Cloz also has non-logo items that you may be looking to purchase for the summer. We are excited to announce a new option that we are offering this summer. Julian Iannini, a former camper and recent graduate of film school in Los Angeles will be joining our staff to produce our camp reunion movie. As in years past, every camper will receive a copy of this in the fall. Typically our reunion movie has been created by a staff member with other responsibilities, however this summer Julian will focus exclusively on video production allowing him to create personalized camper videos. Those who select this option will receive a video that is approximately 10 minutes including a portion that will highlight your son in different camp activities. Julian is quite creative and I am confident he will produce a video that will meet your and my standards. The cost of the video will be $125.00. If you would like to take advantage of this opportunity, please Contact Us and we will add your son to Julian's list of "future movie stars." Your account will be billed accordingly. There is a limited number of campers that can participate in this program. Julian and I have also agreed that we will cancel the program if there is insufficient interest. As I said earlier, we've never done this before and part of the process is gauging interest. The April 2011 NSC newsletter is now online. Read all about the Big Guy's 60th birthday, Andy going global (though we're not expecting any campers from his latest travels), and our newest additions to the North Star staff. We're excited about the summer ahead and while plenty of time remains before we kick off our 67th summer, it'll be here before we all know it. 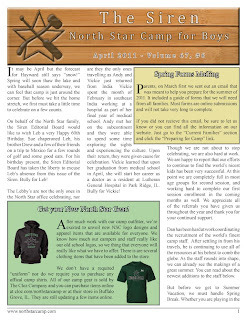 You can access the April Siren here or go to www.northstarcamp.com, click the link for current families, and then you'll find the newsletters in the media room. You can also view past Sirens in the media room if you missed any past issues and want to catch up on the latest camp news and see all the great campers and staff who will be at NSC in 2011!